In this answer, I got to know that during the fight between Parashurama and Bhishma, the spirits of Parashurama's ancestors told him to stop fighting, because he wasn't supposed to act like a Kshatriya anymore. But why wasn't Parashurama supposed to act like a Kshatriya anymore? This question is too generic and I want to know the answer from the character's perspective only. Well since you have asked from the perspective of the character let me try and explain from what I understand of Parshurama's life - His story does not begin with his birth. The difficult decisions he took in his life were a result of the circumstances even before he came into this world that were shaping his destiny. (5-6) From Gâdhi there was the daughter Satyavatî who by the brahmin Ricîka was asked to be his wife..
(8) He as a seer was by his wife and his mother-in-law who each wanted a son, requested to cook a preparation which he with mantras offered to them [to his wife with a brâhmana mantra and to his mother-in-law with a kshatriya mantra]. Then the muni went away for a bath. Rishi Richik/Ruchik prepared a magic potion after combining the roots, leaves and barks of at least a dozen herbs and mixing them with barley, rice and pulses, adding few berries and milk to the mixture. He divided it into two parts and put one portion in the shade of an Ashwattha tree and the other under a giant Fig, blessing both of them by means of magical incantations. (9) Meanwhile, Satyavatî was by her mother asked to give the oblation that was meant for her, because she thought it was the better one of the two. She handed it over to her while she herself ate her mother's oblation. (11) Satyavatî beseeched him that it would not be so and thus the son of Bhrigu said: 'Then the son of your son will be that way!' Thereafter Jamadagni was born. This son of Jamdagni was Parshurama who had inherited the Kshatriya trait even though born a Brahmin. Even with the benediction of Ruchik, his story may have not become so violent had he not come face to face with Kartavirya Arjun the antagonist in his story. Puranas talk highly of this man who is considered an incarnation of Lord Vishnu’s Sudarshan Chakra! 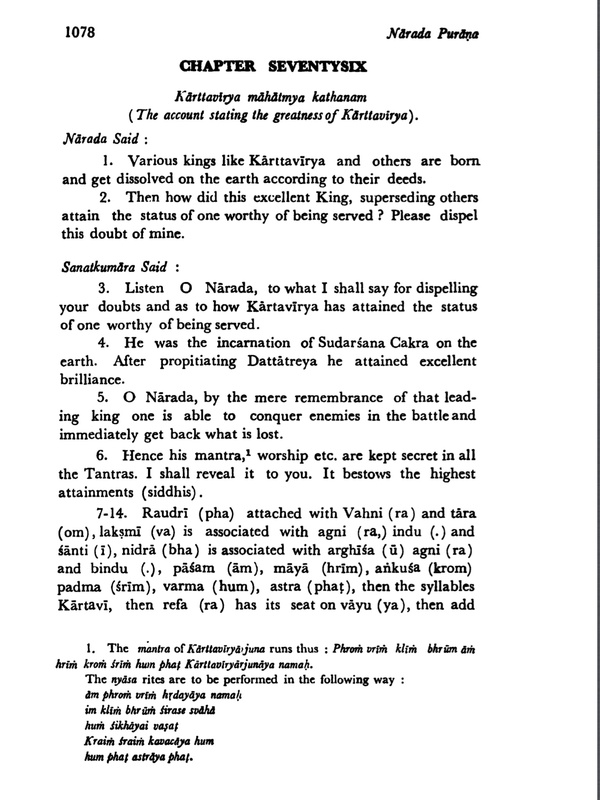 Kartavirya was the GRAND EMPEROR of the globe and his influence had even corrupted other kings of the world and that is why when Parshurama came in confrontation with him, the Avatar did not just stop at killing the emperor but also decided to kill all other corrupt kings. By the time he was done, all evil Kshatriyas had been decimated and new kings were selected from the other castes while some of the original ones also remained. When Lord Rama was born the nature of rulers had changed and Kings like Dashrath and Janak who were taking care of their populace were the norm. Hence when Shri Rama confronted the elder Avatar he taught him a lesson that his work as the slayer of Kshatriyas was over. However again at the time of Mahabharat, Parshurama was called into service by Amba who demanded that he fulfill his promise of rooting off corrupt kings by killing Bhishma. The details are mentioned in this answer so am not going to repeat them but by the time the two were done, Parshurama had to be convinced that he had done enough work to tame the errant kings. His role as the main protagonist was over when he encountered Lord Rama and now that the next incarnation Lord Krishna was there to take care of these arrogant Kshatriyas it was time for him to stop. He is still living though and would become the guru of Kalki, the last Avatar BUT again he shall not be the one to take up arms. Not the answer you're looking for? Browse other questions tagged mythology mahabharata parashurama bhishma . Where is Vālmīki right now?